I travelled around the whole of Iceland (North, South, East, West) with Adam for 10 days in a cute little camper-van which we named Dacy. I had previously travelled to Iceland in winter 2012, but I wanted to experience Iceland in summer. Also, it's been a dream of mine to do a road trip in a camper-van. Adam did most of the planning, so this itinerary is dedicated to him! I figured this general itinerary could give you a sense of how much time we spent in each place, and maybe give you some suggestions on key places of interest/ places you could omit if you don't have as much time. We were practically running on adrenaline the entire trip, which allowed us to explore most of the main bits of Iceland in just 10 days. Of course there were places that we wished we had a bit more time to visit (like Landmannalaugar, and a few more natural hot springs), but you can never have enough time in Iceland! Adam and I rented a small van which we travelled around Iceland in. We mainly drove on Route 1, aka 'The Ring Road', and making occasional turns onto small routes whenever we wanted to visit specific sites or towns. We cooked our meals on a burner, and slept in our van in random locations across the island. Adam is a geologist, so it has always been a dream for him to explore the varied landscape and rock formations in what people have labelled ‘the closest thing to Mars on Earth’. Both of us also enjoy photography, so we planned our trip around (good summer lighting) sunrise and sunset hours (i.e. we operated on a 3pm-5am basis, and slept from 5am – 12+pm everyday). Another bonus of operating on this schedule was that we avoided busloads of tourists at attraction points and had the entire road to ourselves in the wee hours. Other than staying at campsites every 3 days to use their kitchen and shower facilities (except on our first night in Reykjavik), we did not spend any money on accommodation. It was a very enjoyable trip overall: we got to see many unprecedented views and landscapes like glacier lagoons, sulfur mines and puffin cliffs. The most amazing part was just waking up to a new view everyday – one day we could be parked on a sloped plain blanketed in fog, only to realise the next morning that we were perched on top of a mountain overlooking a beautiful fjord! Lastly, it was a very affordable trip: we were able to travel around Iceland just under £600 for 10 days (including petrol, groceries, car rental, flights, transfers) - not too bad considering the amount of food we eat! Daily routine of setting up the foldable table and burner to prep our meals after finding a suitable stop to park for the night. Scroll down to the bottom of the page to obtain to the link for Lin's Iceland Google MyMaps. You can buy tickets directly from the airport counter; buses are scheduled to leave 30-45 mins after each flight arrival. Downtown Reykjavik is very small and walkable; you can probably cover all the main sights in a day’s time. GoCampers: We would recommend GoCampers for its professionalism, good customer service, affordability and cleanliness. We rented a Go SMART Camper 2-pax which is perfect for two travelers who just need a shelter over their heads, some storage area, and a place to sleep. We brought our own bedding and pillowcases… and even a duvet! It gets chilly at night, even in summer. Golden Circle: Geysir field, Gullfoss (waterfall), Þingvellir National Park - a rift valley where you can observe the continental drift between the Mid-Atlantic and Eurasian plates. DC Plane wreck: Located on Solheimasandur Beach - in between Skogafoss and the town of Vik. I used this site to find the (not-so-secret-anymore) plane. Apparently they have shut the gates off, so you are not allowed to drive onto the road that leads you to the plane. We had to walk for 4km (~1hr) to get to the plane. Reynisfjara is Iceland's most famous black pebble beach, complete with basalt column caves and rock formations eroded by wind and sea. Beware of the strong waves which have been known to gobble up curious tourists who wander too close to the shoreline. A picturesque town known for its church that sits on top of a hill overlooking the town. Lush purple Icelandic lupines are found in abundance in fields here. 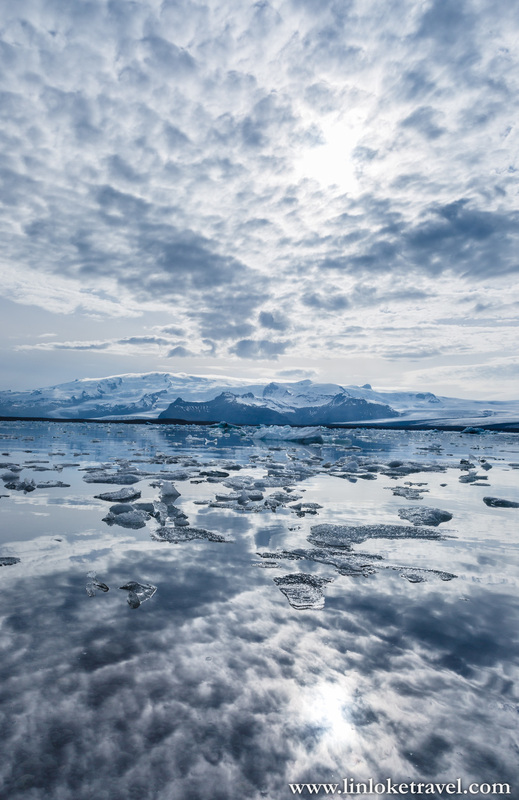 Jökusárlón: the iconic glacier lagoon of Iceland which needs no further introduction. We recommend a walk along the Jökusárlón beach towards the glacier, instead of standing around the crowded tourist point. Walking away from the bustling tourist drop-off point allowed us to truly appreciate the entirety of the beauty of the lagoon: in addition to observing majestic shards of resting icebergs was the beautiful sounds of crackling melting glacier ice and rumbling thunderclaps of ice shards breaking off from the distant glacier sheet. Note: We spent a day driving along the scenic East fjords. We drove through small towns like Breiðdalsvík, Fáskrúðsfjörður, Reyðarfjörður, but we did not stay in each village long. Whilst driving along scenic volcanic mountains and fjords, you will find that the landscapes undergo quick transformations as you drive north: one moment you could be driving through thick fog, and another moment, up onto a snowy mountain, and down into a sun-lit fjord. However, there wasn’t anything in particular which interested us enough to spend more time than a day driving through. Seydisfjordur: We liked Seydisfjordur a lot – a small town in a fjord that has an important ferry port which links Iceland to the Faroe Islands and Denmark. The town is also known for ‘The Blue Church’ and its intricate and colourful wooden houses. - Overnight in Bordeyi (Town located on the intersection between North, Northwest and West Iceland). Myvatn is known as the Northern Lights Capital of Iceland. The northern part of Iceland is slightly more rural; it has an abundance of (sensitive) wildlife, lakes, waterfalls and geothermal areas like volcanic hot springs and sulfur rich mud pools. We did a little hike around Grjotagja lava fields, and explored the underground natural geothermal pool of Grjotagja Cave which was filled with blue sulfur-rich water. We really liked Hveradalir, a volcanic spring surrounded by sulfur-coated mountains, which resembled Martian landscapes that you usually see on sci-fi films. Be prepared for the reeking stench of rotten eggs in an area filled with bubbling mud pools and loud, hissing fumaroles. Akureyi: We absolutely LOVED Akureyi, Iceland’s 2nd most populated town after Reykjavik. Akureyi is an artsy town with a modern feel – cafes, hostels, bars, and small restaurants selling international cuisine. One of our food highlights was the Birthday Burger in the unassuming restaurant down the end of the main street, Bautinn. - Note: The Northwestern Peninsula is completely off the main ring road. Roads here mostly gravel roads with many potholes. We are advised that it was OK to drive along these roads, even without a 4 X 4. However we had to drive extra slow and carefully. - FAQ: Should I visit the Northwest? Travellers visiting Iceland usually ask whether they should omit the Northwest Peninsula from their itinerary due to restrictions on time. Personally, I really enjoyed the southern parts of the Northwest Peninsula, i.e. my first experience of being up close and personal with the puffins at Latrabarg cliffs + exploring Breidavik area. I would try to include these areas in my itinerary. Only in the essence of limited time might I omit the long and winding drive up to the northern parts of the Northwest Peninsula (i.e. the drive from Bordeyi to Isafjordur via Drangsnes) and instead drive directly from Bordeyri to Latrabarg via Floklundur. While the Northwest is beautiful and untouched, I feel there are more things to see in the Western Peninsula. Gvendarlaug hot springs is a lesser-known small-sized hot pool owned by Laugarhól hotel. Laugarhól hotel is a standalone hotel located in a secluded mountain region. You have to pay an entry fee (something less than £3) to use the hot spring, but this includes the use of their shower facilities and their man-made swimming pool overlooking the quiet village. The entry fee also allows you to visit ‘The Socerer’s Cotttage’ which is basically two turf houses which were previously used to house individuals accused of witchcraft in the 17th Century, prior to public execution of some sort. Breidavik: A vast and quiet beach with clear waters close to Látrabarg Puffin Cliff. En route to the puffin cliffs, you may come across Hnjótur Folk Museum. We did a quick stop there to explore its outdoor motor junkyard, which houses a collection of worn out planes, ships and a fire-engine. Stopping for a BBQ dinner from Northwest peninsula en route to West Fjords. Látrabarg Puffin Cliff: Home to a colony of Atlantic Puffins and other birds, especially seagulls. Takes about 20-30mins to walk from the foot of the cliffs to the other end of the cliffs. Be careful around cliff edges: get down on your elbows and knees to peer over cliff edges to sight for birds nestling in cliff holes. Images below shows the different perspectives of photographing a puffin. Left: cute puffin at an arm's length; Right: a group of people crowding around that little puffin just to get a picture of it! Stykkishólmur: This fishing village town has become a popular tourist destination in recent years. There are slightly more facilities in this town including a spacious campsite, bakeries, petrol stations and a small fishing port. 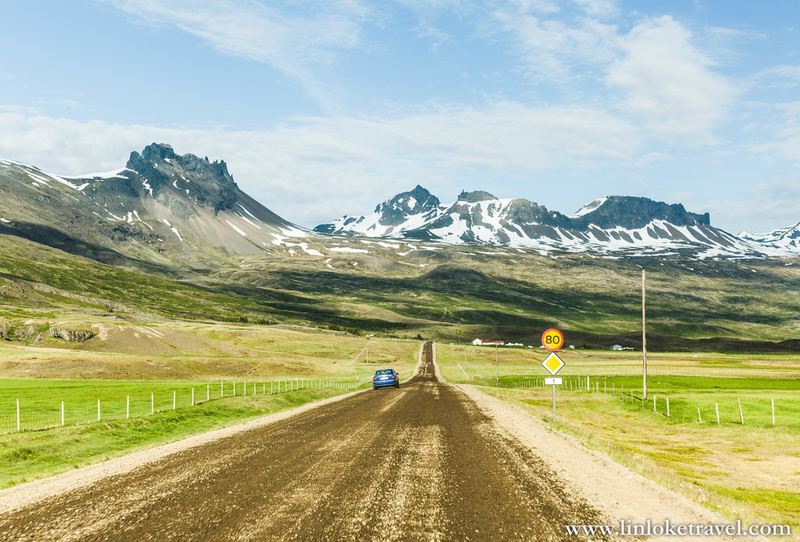 - Drive to Reykjavik to return campervan at 5am. Grundarfjordur: What I liked to call ‘Walter Mitty Town’, it is a town located in a beautiful fjord on the north coast of the Snæfellnes Peninsula. I instantly recognised this town from a few scenes in the film ‘Walter Mitty’ due to its distinctive volcanic mountain ranges and small and colourful houses. Kirkufell: This conical volcanic mountain by a small waterfall is a photographer’s favourite. Snæfellsjokull National Park: Contains the ‘main’ glacier of the Western peninsula – you can’t miss this snow-capped mountain which seems to dominate the Western skyline. Other places of interest in this area include Saxholl Crater and Vatnshellir Cave. We recommend a quick and easy 10-min hike up a steel staircase that takes you up the top of Saxholl crater which gives you beautiful views of the Snæfellsjökull Glacier and lava fields. Djupalonssandur: Djupalonssandur means ‘Deep Lagoon’s Sand’. This area consists of a short walk down through a lava field with a few lagoons and dramatic lava rock formations. You will eventually end up on a black sand beach scattered with pieces of rusty shipwreck, surrounded by unique rock grottos clothed in seaweed and more columnar basalt cliffs. Overall, I found this place really ‘mythical’ due to its interesting rock formations and various myths told about the area. Arnastapi: An ancient fishing station known for its beautiful grottos, basalt cliffs, and quirky rock formations by the coast. Take a nice long hike through its coastal trail that cuts through a hilly lava field. We started from Hellnar and walked along this coastal route to Arnastapi. Hellnar: A fishing village known for the Hellnar Church (a cute little church, but honestly not very different from other churches found in Iceland…). We highly recommend Primus Kaffi. We had the most amazing chocolate cake and homemade Icelandic meatballs/ seafood soup before embarking on our little hike from Hellnar to Arnastapi via a well-built timber coastal trail. Click here to obtain the Google My Map for all the places of interest as described on this post!